Robert Alan Eustace is an American computer scientist who served as Senior Vice President of Knowledge at Google. Since October 24, 2014, he holds the world record for the highest-altitude free-fall jump. The son of a Martin Marietta engineer, Eustace grew up in Pine Hills, Florida, then a working-class suburb of Orlando, where small ranch houses had been built for employees of the company. After graduating from Maynard Evans High School in 1974, he received a debate scholarship from Valencia College and attended it for a year before transferring to Florida Technological University — now known as the University of Central Florida — to major in mechanical engineering. As a university student, Eustace worked part-time selling popcorn and ice cream in Fantasyland and working on the monorail at Walt Disney World. However, after taking a class on computer science, he decided to switch majors and ended up completing three academic degrees in the field, including a doctorate in 1984. After graduation, Eustace worked briefly for Silicon Solutions, a startup in Silicon Valley, before joining Digital, Compaq and then HP’s Western Research Laboratory, where he worked 15 years on pocket computing, chip multi-processors, power and energy management, internet performance, and frequency and voltage scaling. In the mid-1990s, he worked with Amitabh Srivastava on ATOM, a binary-code instrumentation system that forms the basis for a wide variety of program analysis and computer architecture analysis tools. These tools had a profound influence on the EV5, EV6 and EV7 chip designs. Eustace was appointed head of the laboratory in 1999, but left it three years later to join Google, then a four-year-old startup. At Google, he worked as Senior Vice President of Engineering and served as Senior Vice President of its Knowledge department until his retirement on March 27, 2015. He was also actively involved in a number of Google’s community-related activities, such as the Second Harvest Food Bank and the Anita Borg Scholarship Fund. In the course of his professional career, Eustace has co-authored 9 publications and holds 10 patents. In 2011, Eustace decided to pursue a stratosphere jump and met with Taber MacCallum, one of the founding members of Biosphere 2, to begin preparations for the project. 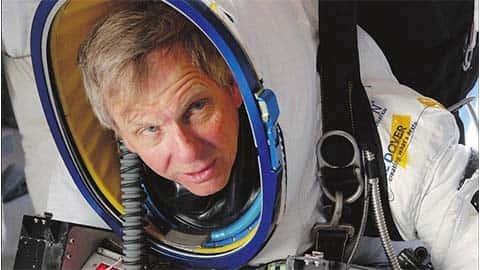 MacCallum’s company, Paragon Space Development Corporation, created a life-support system to allow Eustace to breathe pure oxygen in a pressure suit, designed and built by ILC Dover, during his ascent and fall. Over the next three years, the Paragon Space Development technical team designed and redesigned many of the components of his parachute and life-support system. On October 24, 2014, Eustace made a jump from the stratosphere, breaking Felix Baumgartner’s 2012 world record. The launch-point for his jump was from an abandoned runway in Roswell, New Mexico, where he began his balloon-powered ascent early that morning. He reached a reported maximum altitude of 135,908 feet (41.425 km; 25.7402 mi), but the final number submitted to the World Air Sports Federation was 135,889.108 feet (41.419000 km; 25.7365735 mi). The balloon used for the feat was manufactured by the Balloon Facility of the Tata Institute of Fundamental Research, Hyderabad, India. Eustace in his pressure suit hung tethered under the balloon, without the kind of capsule used by Felix Baumgartner. Eustace started his fall by using an explosive device to separate from the helium balloon. His descent to Earth lasted 15 minutes and stretched nearly 26 miles (42 km) with peak speeds exceeding 821.45 miles per hour (1,322.00 km/h), setting new world records for the highest free-fall jump, and total free-fall distance 123,334 feet (37,592 m). However, because Eustace’s jump involved a drogue parachute, while Baumgartner’s did not, their vertical speed and free-fall distance records remain in different categories. Unlike Baumgartner, Eustace, a twin-engine-jet–rated pilot, was not widely known as a daredevil prior to his jump.